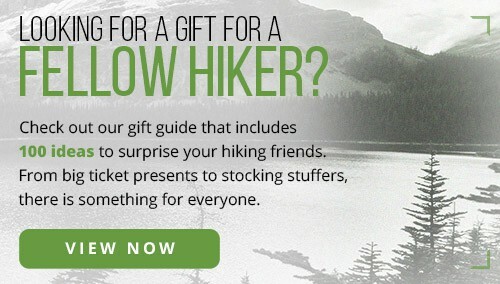 If there’s a general rule for hiking in hot weather, it’s this: “More coverage is always better.” You will rarely see experienced hot-weather hikers without their hats, and you’ll never see them without their shirts. 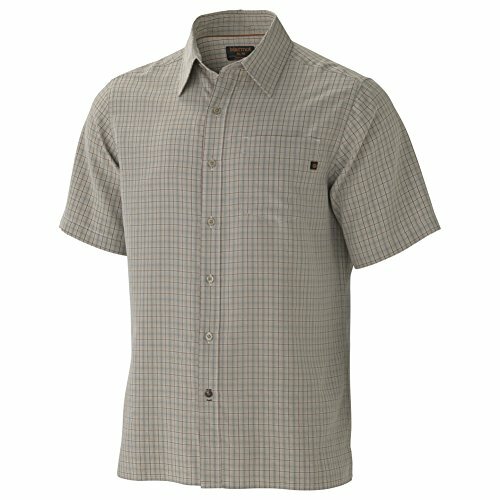 The best shirts for hot weather provide coverage and comfort. Some shirts will even cool you off as you negotiate the sun-drenched trail. Indeed, a comfortable shirt, one that keeps out the sun’s harmful rays but still lets in the cooling breeze, can be the difference between a pleasant walk in the sunshine and a march through Hades. 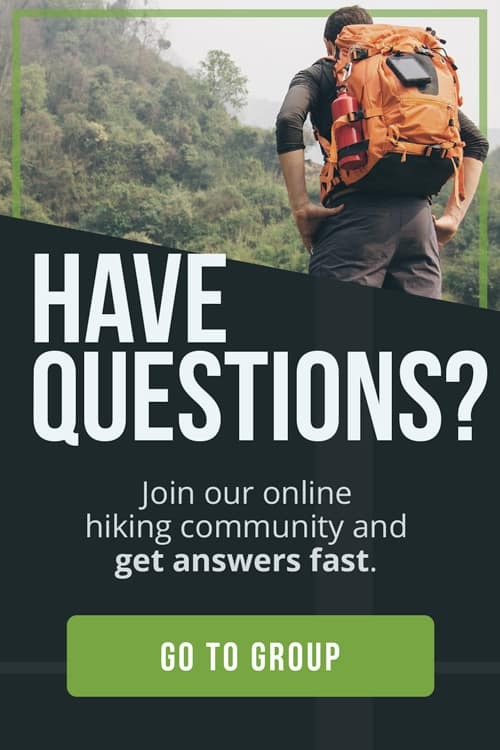 Here at The Adventure Junkies, we will help you choose the ideal shirt for hiking in the heat, whether you’re heading out on a day hike or mounting an epic journey. We’ve listed the 10 best hot-weather shirts out there. All of them protect against UV light despite offering varying materials, style and features. 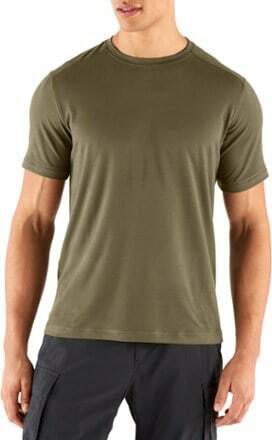 A hot-weather hiking shirt should be constructed from breathable, light-weight material that does not chafe the skin. Most shirts for hot weather are made of synthetic materials, such as nylon, polyester and spandex, with a bit of cotton sometimes thrown in as well. Such blends wick away sweat and allow air to circulate, keeping you relatively dry and cool under the sun. 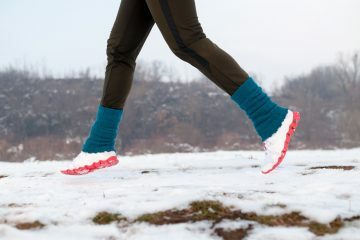 These synthetics are also typically lighter than other materials, so you won’t feel like you’re wearing a wet blanket. 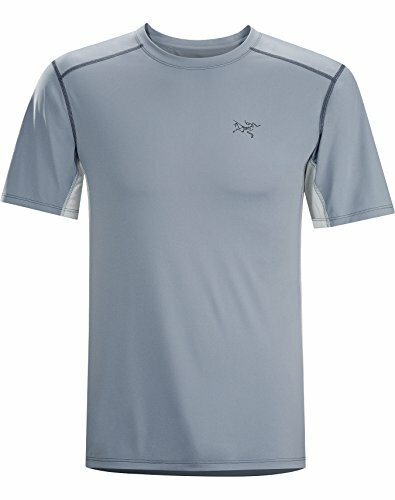 Some shirts have mesh panels that allow for more air flow. 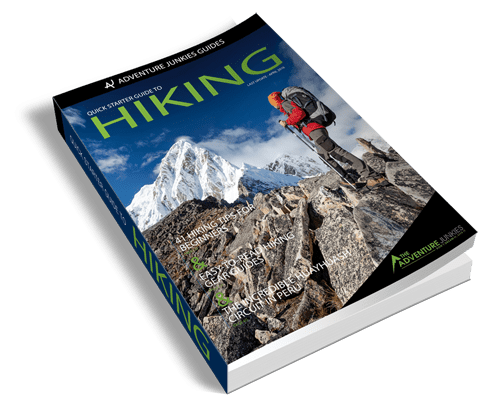 Many hiking shirts designed for hot weather have antimicrobial properties, which help cut down on the inevitable odors that come about from hiking in the heat. 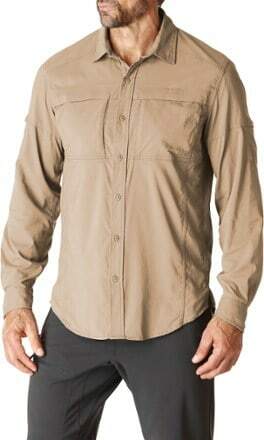 The most important thing to consider when choosing a material for your hiking shirt is how it feels on your body. Nothing ruins an otherwise great hike like poorly chosen gear. Take your time and try on several different blends to find the perfect one. 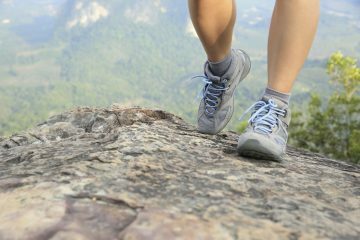 It’s also a good idea to wear the shirt outside — not just in your living room or the fitting room — before taking it with you on the trail, to see how it breathes. A shirt’s Ultraviolet Protection Factor (UPF) is an important consideration because the sun’s rays are probably the most dangerous thing you’ll encounter on any hike. Prolonged, unprotected exposure to the sun increases your chances of developing skin cancer. The risk increases mightily if you get sunburns. According to the Skin Cancer Foundation, “clothing can be your most effective form of sun protection.” They advise wearing clothing with a UPF of 30 or higher. That means it will block all but 1/30th of the sun’s harmful UV radiation so the higher your UPF goes, the more you’ll be protected. The highest UPF is 50, allowing just 2 percent of UV radiation through. 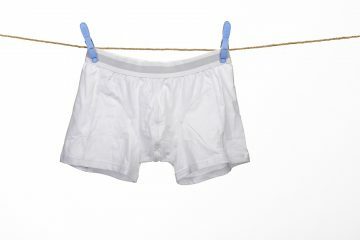 The materials that typically have high UPFs are lycra, polyester and nylon. But, remember that even the highest UPF will be compromised if your shirt gets wet or stretched out. Also, just because you have a UPF 50 shirt on, don’t forget about the other exposed parts of your body especially your head, your neck and the backs of your legs. This is a tough decision. While we must remember that more coverage is always better than less coverage, some people just can’t stand wearing long sleeves. Long sleeves can be a bit restricting in some situations, and it seems somehow counter-intuitive to wear them when it’s hot outside. 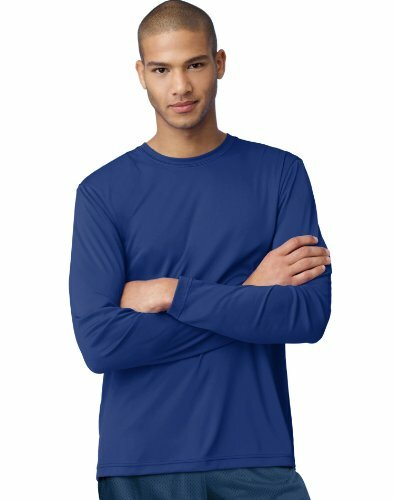 But if the shirt is light enough and it breathes well, long sleeves can add an extra layer of protection for your arms which get more direct daily exposure to the sun than most other parts of the body. Long sleeves are particularly useful in the desert, where you also have to worry about thorny bushes and blowing sand. 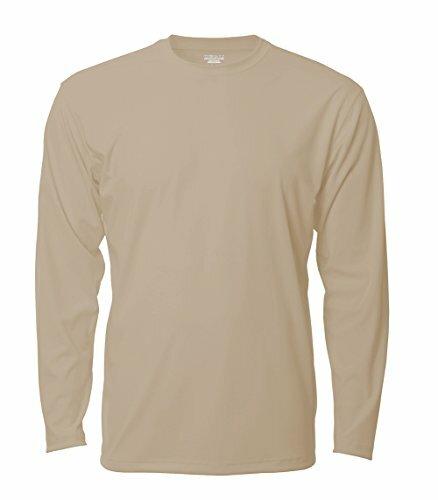 Long sleeves will also protect your arms from getting scratched up when you’re scrambling over boulders or moving through thick overgrowth. Plus, you can always roll them up. 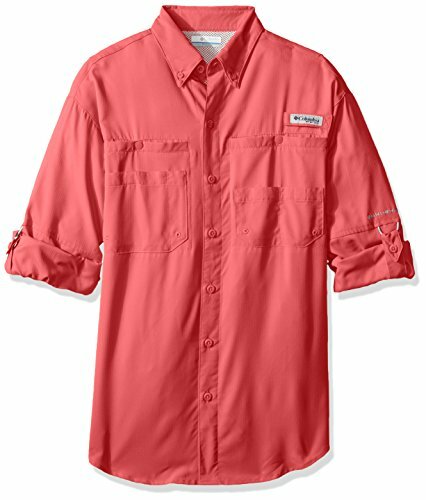 The style of hot-weather hiking shirt you choose is about more than your particular taste or fashion sense. 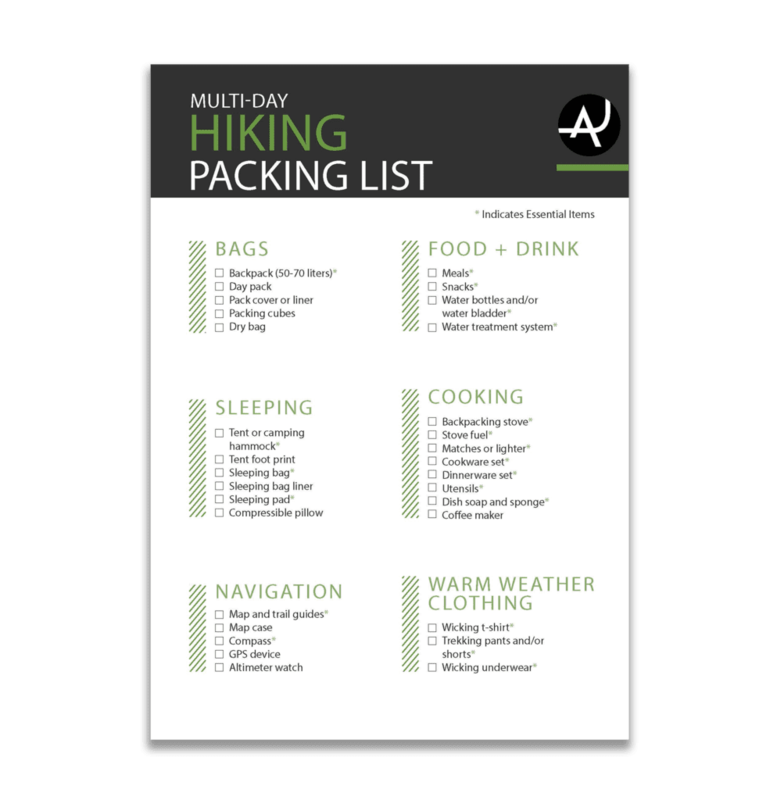 First, consider what kind of hike you’re planning. Is it a 5- to 10-mile day hike, or is it an overnight expedition to the bottom of the Grand Canyon? Should your shirt fit tight like a glove, or should it be roomy and loose. Do you need pockets? Do you need a collar that you can raise to protect your neck from getting burned? Which colors reflect sunlight the best? There are two basic styles of shirts for hot weather: crew and button-front. Both styles come in both short-sleeve and long-sleeve. 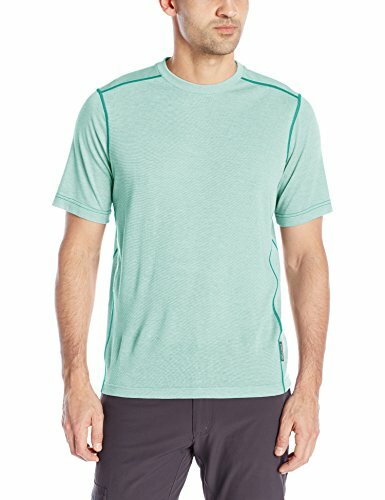 Generally, the crew style, which is your basic T-shirt without pockets, fits best for short day hikes, trail-running and regular exercise. 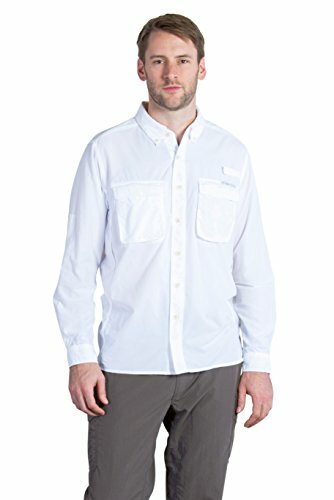 For long or multi-day hikes, a long-sleeve button-front with lots of pockets and a neck-saving collar might be a better choice. Of course, the most important consideration is comfort. Does the shirt feel right? 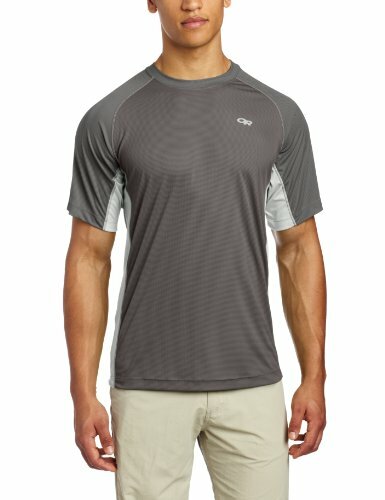 Many crew-style hiking shirts offer a tighter fit, so consider going up a size if you want more room. Button-up shirts typically have a looser fit, though some are form-fitting around the middle and can be uncomfortable if too tight. Again, try on several styles before deciding, so you can find the best fit for your needs. Grey is one of the most common colors for hiking clothes, but bright colors work well too and have the extra advantage of standing out and allowing people to see you coming. While most hiking shirts for hot weather have wicking and quick-drying features, some also have high-tech compounds in their blends that actively cool you down. Others use mesh or some other venting material under the arms and on the shoulder blades to help cool you down. These features aren’t essential, but every little detail helps when you’re out there in the hot sun. Cooling-compound technology certainly represents the future of hot-weather clothing.